Here are two great ways to start moving while being able to easily get through your email, talk on the phone and move those legs. No sweating to worry about and it will most likely help you with your alertness and digestive system. Under Desk Exercise like The Walkstation has an under desk treadmill and now the question is no longer “do you walk to work” it will be do you walk at work. Walking intermittently throughout the day instead of sitting all day promotes better back health and reduces stress and what could be easier than bringing the exercise to the desk. The Walkstation is a walking speed treadmill that’s integrated into a desk — allowing you to work and keep your body moving at the same time. The console displays the distance travelled, time, speed and calories burned. Unfortunately the Walkstation doesn’t seem to be available anymore, but there are newer design to his the market. The are doing really well in the corporate world. 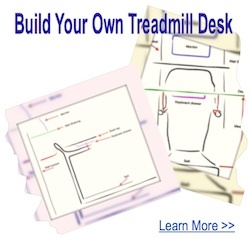 Then there is always the option of building your own treadmill desk, here are some ideas for a DIY desk treadmill. 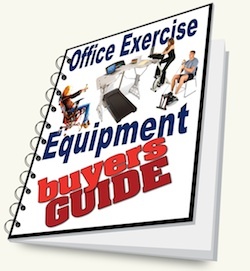 Office exercise machines, like this allows you to move while you work without interrupting the work of those around you. With a whisper quiet motor designed to withstand the rigors of slow speeds and possible higher weights for long periods of use. Although quality treadmill desks aren’t cheap – they are solid and accommodating. Most desks are adjustable for the individual user and it is rapidly increasing in popularity where companies are acquiring these for their workgroups, this way people can take turns and reserve the walking desks for a set period during the day. 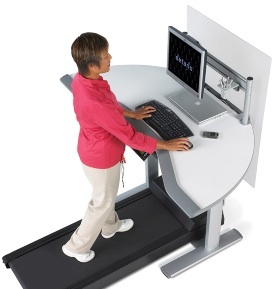 Another example of desk exercise equipment is the Gamercize which is a small compact stepper. 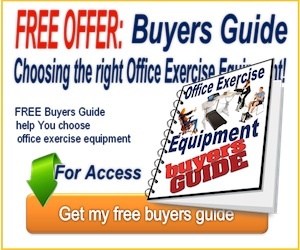 You can use it sitting or standing, working or playing. It’s a new style of exercise machine boasting that you would to be able to burn up to 400 calories an hour. Simply plug it in by USB to your computer or X box. Once you are hooked in you have to keep moving or else the Gamercize will take over your key board, mouse or joystick and won’t give you back control until you get moving again. BUT if you are at work the boss may not like you having things plugged into your xbox or computer so an alternative to this is the electronic stepper. The brand “Gamercize isn’t in production any more but there are a variety of mini steppers to choose from. 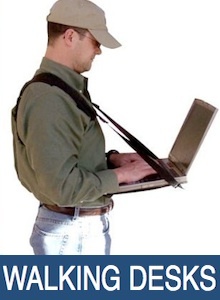 The walking desk is something you can carry with you for people who have to take their desks on the job. Hi – thanks for the info. I love the idea of using games to get fit!